Since the 1990s we have been producing two books to enrich your Lilliput Lane collection. Lilliput Lane – The Complete Collectors Guide was released in 1995 as a loose-leaf reference book, with full colour pictures and information about each model. Starting with almost 1,000 pages, the book has grown with semi-annual updates to over 3,600 pages in length! The Pocket Guide to Lilliput Lane™ Cottages was introduced in 1998 to meet the needs of collectors who wanted to carry a quick-reference guide with them when shopping for models. To keep this book current, we have produced either a new edition or a supplement to this book every two years. We have both retired from our regular jobs, and family obligations along with other activities and factors make it necessary for us to announce the retirement of our books. We will be discontinuing our updates to Lilliput Lane – The Complete Collectors Guide at the end of 2016. Until then we will continue to sell extra binders (although we do not have many left) and, if your book is not up-to-date, updates for all previous years. Starting in 2017, these items will be available for sale only if we still have inventory. Similarly, we will no longer be producing new editions or supplements to The Pocket Guide to Lilliput Lane™ Cottages, so the sixth edition with the 2008–2014 supplement is the last edition of that book. We want to thank each of you for your dedication to our books. Producing them has required a lot of hard work over the past two decades, but we are proud of what we have accomplished, and the kind words you have given us about the books are very much appreciated by us. May 2014, and replaces earlier supplements. This spiral-bound pocket guide is an easy-to-carry reference on all Lilliput Lane models. Measuring 4-1/8" x 7-3/4", each page of cottages in the 6th edition has colour pictures of four to five models along with key information on those models. Details include how to easily identify every known version of the model, issue and retirement dates, issue price and current value, dimensions, and the village, town or country where the building is located. The models are listed in alphabetical order, and the book also has eight invaluable indices: models by collection, models in annual collections, exclusive models, by location of the original building, by building type, by introduction date, by retirement date, and by product code. See a sample page from the book. New editions of the book are published approximately every 2 years. The current version is the 6th edition (June 2008) along with the 2008-2014 supplement to the 6th edition (June 2014), together containing 688 pages. The 2008-2014 supplement will be available from June 2014, and replaces earlier supplements by covering all models from June 2008 through May 2014. Since the 5th edition, the book includes a plastic case and maps of the counties in the U.K. and the states in the U.S.A.
All editions of this book have been written by Viv Marston and Don Gibson. This loose-leaf book is a detailed reference on Lilliput Lane models. Each page, which measures 5-½" x 8-½", has a large full colour photo of a model on one side, and detailed information on the model along with a black and white photo on the reverse. The models are listed in chronological order, and the book also has an index listing the models in alphabetical order. Five custom-designed binders are included in the purchase price of the book, and extra binders may be ordered to hold updates. Updates to the book are published twice a year (in May and December) as part of an annual subscription. The loose-leaf format of the book allows you to insert the new pages so that your book is always up-to-date. A price guide is included each year with the second update. As of the May 2014 update, the book contains almost 3500 pages. The original book and updates through 1998 were written by Dan Komar with Viv Marston. All updates since 1999 have been written by Viv Marston and Don Gibson. Please refer to the order form for details on prices and postage. The figures are great! Your Pocket Guide is possibly more impressive. I can only imagine the amount of effort required to build and maintain this excellent and high quality reference. The attention to quality also shows in the accessories like the color and size rule, custom plastic pouch, map, and highlighter. It's a real pleasure to see and own. Thank you! Yesterday I duly received "The Pocket Guide to Liliput Lane Cottages". In addition to enjoying the pictures of many cute cottages, I am amazed at the comprehensiveness and perfectness of the records. The categorization in various ways in volume 2 also enables the readers to enjoy the book even more. You have done an amazing job. My goodness it must have been quite the undertaking - there is so much information. 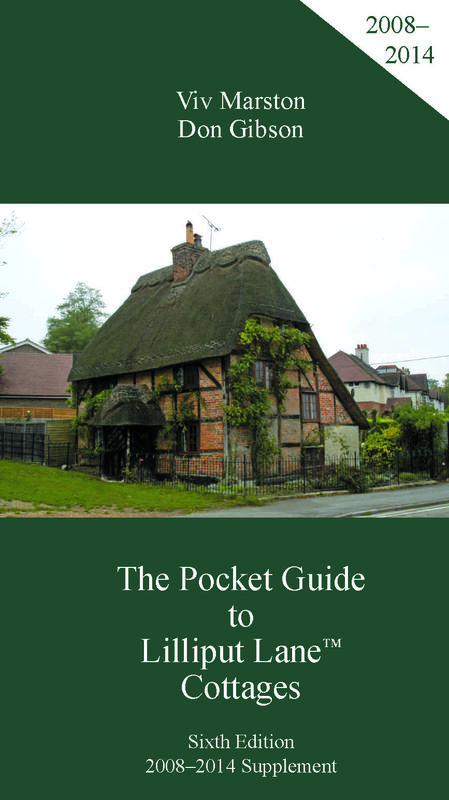 I can't tell you how tickled I am about "The Pocket Guide to Lilliput Lane Cottages". I have studied the guide inside and out and my husband thinks I'm crazy but I just wanted to let you know that you have done an amazing job on the book. I can't even give you a suggestion for improvement on your next version! Thank you, thank you, thank you. I just received the second edition of "The Pocket Guide to Lilliput Lane Cottages" ... You've made many wonderful additions to the guide. I especially like the listing of models by location. If I ever get the time/money to travel to the UK, this is definitely the section I would use! Thanks again and congratulations on a wonderful 2nd edition. The book ["The Pocket Guide to Lilliput Lane Cottages"] is as it promises - a pocket guide to Lilliput Lane Cottages and merchandising. It's perfect for slipping into a bag or pocket as it carries photographs and identification tips for determining which version of a piece you are looking at, something which is invaluable to the buyer as it could mean the difference between several hundred pounds in value. "... collectors worldwide have become part of our extended Lilliput family and their constant thirst for detailed information about the models, their background and vernacular architecture has led to the development of this guide. I am extremely impressed by the energy and effort that has gone into assembling this information for those collectors who believe as we do in the integrity, quality and outstanding detail the Lilliput collection offers. For those wonderful people who created the success we now enjoy, I can think of no better collecting companion than "Lilliput Lane® - The Complete Collectors Guide!" Please contact us with any questions you might have, or to place an order. You may also order our books by printing our order form, filling it in and posting it to us. Research for the first edition of Lilliput Lane® - The Complete Collectors Guide and 1996 through 1998 updates was conducted by Dan Komar and others on his behalf. 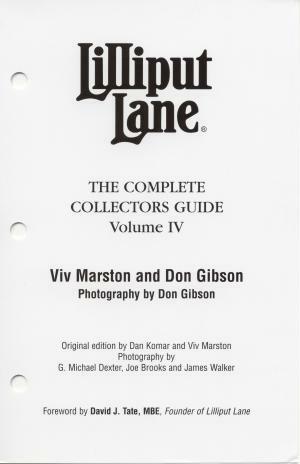 Research for updates to Lilliput Lane® - The Complete Collectors Guide starting in 1999 was conducted by Viv Marston, Don Gibson and others on their behalf. ENESCO LTD takes no responsibility for the accuracy of the information in these books, nor accountability for any misuse or speculation the information may cause.